In An Giang Province in the Mekong River Delta, tourists are amazed by the fish cages jostling against one another on the Hau River besides a serene village of the Cham ethnic minority. From the town of Chau Doc, it takes only a moment by canoe for over 3,300 floating fish pens to come into view. Hanging electric wires crisscross over the pens and make the view more interesting, as if you had entered another world. Upon disembarking onto a stilt house, tourists will be warmly received and introduced to the culture of raising fish in pens. The pens are ingenuous devices that protect the fish from predators and keep them available while maintaining them in a natural habitat. 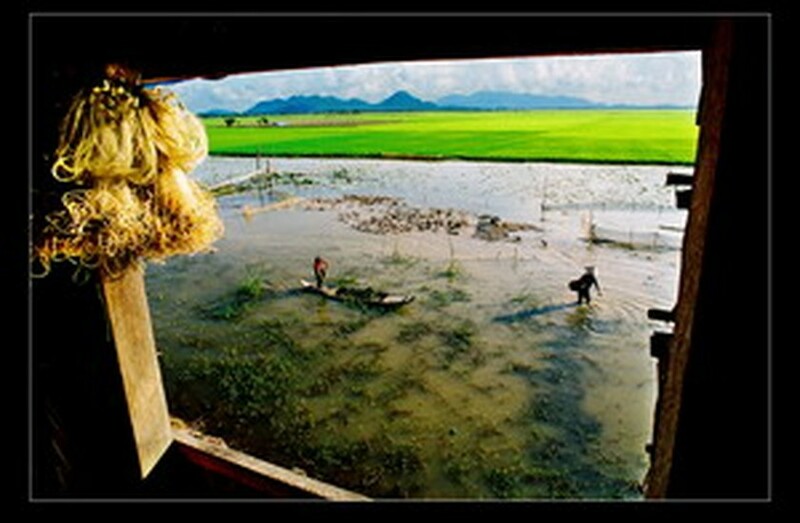 The pens, each of which costs between VND100 million and VND500 million (US$31,250) are usually made of mesh and placed under a stilt house. The floor is connected to the cage through a pipe which is use to pass food to the fish. 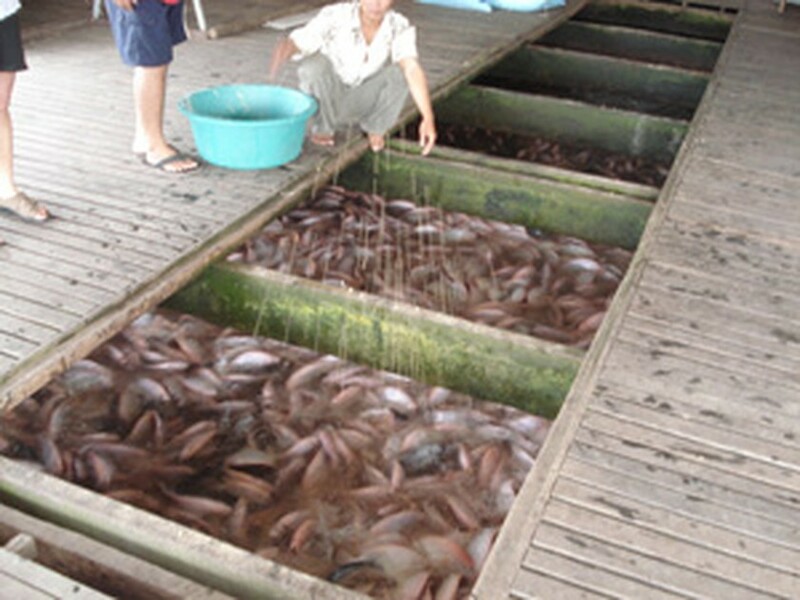 The fish are fed broken rice, bran and small fish mixed into tight balls by a machine nearby. When the lid is opened and balls lowered into a square hole down the pipe, thousands of fish come up to eat as if from nowhere. Catfish are voracious and don’t mind tourists. Goby are more reticent and come up only when humans are some distance away. The moment food is dropped is the only time you can see their sparkling backs as they swarm violently toward the food, causing a vast area to bubble up. Thousands of black gudgeons, some weighing dozens of kilograms and shaped like small torpedoes, as well as silver-white catfish will bounce up and down excitedly like they have never eaten before. This breathtaking sight testifies to the tenacity of life in a place where humans and nature coexist. Leaving these wonderful pens and crossing the river, tourists will lose themselves in the strange world of the Cham people. After crossing a rudimentary wooden bridge, you will set foot on terra firma. Just a minute before, you were standing on an unstable stilted floor. Upon arriving in the village of Chau Giang, you will be cordially greeted by local girls in colorful costumes and scarves who once in a while smile sheepishly and would love to receive small gifts from travelers. What they like most are pens. They need them for school. Walking along, you will see stores that sell fabric woven by the Cham people. There are sarongs, a cloth to wrap round your body from the navel down. Cham men and woman both wear sarongs. Before you get too excited, the women have another cloth to cover their chests. Scarves and brightly colored hats are available. Tourists too can visit workshops where attractive girls weave cloth into eye-catching fabrics. If you are Muslim, you can pray at a nearby mosque.